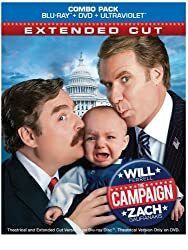 THE CAMPAIGN (2012) ELECTION PROMOS - WILL FERRELL, ZACH GALIFIANAKIS MOVIE .. THE CAMPAIGN OFFICIAL TRAILER #2 (2012) - WILL FERRELL, ZACH GALIFIANAKIS M .. THE CAMPAIGN MOVIE CLIP - DOG WILL HUNT (2012) - WILL FERRELL, ZACH GALIFIA .. THE CAMPAIGN (2012) MARTY HUGGINS ELECTION PROMO - WILL FERRELL, ZACH GALIF .. When long-term congressman Cam Brady (Will Ferrell) commits a major public gaffe before an upcoming election, a pair of ultra-wealthy CEOs plot to put up a rival candidate and gain influence over their North Carolina district. Their man: na‹ve Marty Huggins (Zach Galifianakis), director of the local Tourism Center. At first, Marty appears to be the unlikeliest possible choice but, with the help of his new benefactors' support, he soon becomes a real contender. As election day closes in, the two are locked in a dead heat, with insults quickly escalating to injury until all they care about is burying each other in this mud-slinging, back-stabbing, home-wrecking comedy from Meet the Parents director Jay Roach.